Our mission is to help optimize human capital. We want to help companies make human capital decisions in the same way they make financial capital decisions - using data-driven rigor and analysis. The People Analytics Corporation is committed to working with the world’s leading organizations and governments to measure and optimize their people using data. We help organizations understand what traits and characteristics define their top talent. We use that data, along with our leading cloud-based assessment tool to help them measurably hire better people and track success. Managers can use that same data to better support, understand and develop their talent. The People Analytics Corporation worked with a global retailer to understand what traits made their top salespeople stand out. 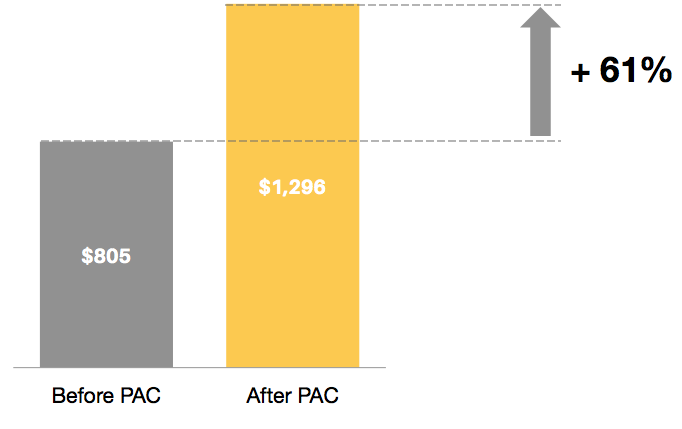 We started by using our PAC Study tool to understand the performance of current employees. We took employee sales numbers and understood who the company's top performers were. By measuring each employee across 100+ traits, PAC was able to produce a predictive hiring model that is projected to increase sales productivity by 61%. Using this data, the company is able to administer a short assessment to all incoming candidates, using PAC Select in order to predict success and highlight potential weaknesses. PAC’s unique approach relies on truly understanding what drives success in your organization and constantly measuring and revisiting assumptions using data. We first aim to measure your current workforce, and use your company benchmarks to help understand who is a top performer. We then apply those insights to help you select the best people that apply for your jobs. We continuously refine this data every six months in order to optimize the work that we do. We measure your current employees and get input from experts in your company in order to define a role based on your top performers. PAC measures candidates across 60+ dimensions, including personality, integrity, and values, to help you interview only the candidates most likely to be top performers. We review the results of your hiring using the PAC tool and ensure you're both hiring the best and also complying with legal considerations. We work with your organization to refine hiring models based on how they work for your organization and your evolving needs. The core question of any organization is “how do we hire the best people”? We built PAC Select for that exact purpose - to help you hire the best people, period. Instead of looking at endless resumes and filtering by the school they went to, companies use PAC Select to tell them who to interview, and how to interview them. PAC Select is 2-4x better at predicting the right employees versus looking at traditional resumes. By measuring your current workforce against a set of competencies unique to your company, PAC is able to let you know who is performing and why. Imagine being able to understand why your top salespeople act the way they do, and using that data to hire more of them. PAC applies these insights to each person who applies for your jobs, and constantly refines this data every six months. How do you optimize your current workforce to produce the best results? Many organizations manage and develop their current employees through guessing and traditional methods. PAC aims to optimize each employee by understanding each of them and how they work together. We focus on team building, mobility management and career development for your current workforce. We also work with clients on an as-needed basis to deliver custom solutions to their organization. Examples of this can include API integration work, white-labelling assessments and building custom data dashboards. Previous custom solutions have been provided for top-tier schools and governments. Contact us to learn more about our custom solutions.